Family-owned and internationally renowned Italian design firm, Minotticucine, takes inspiration from the majestic architecture of the church of San Giorgio near their headquarters in Verona. 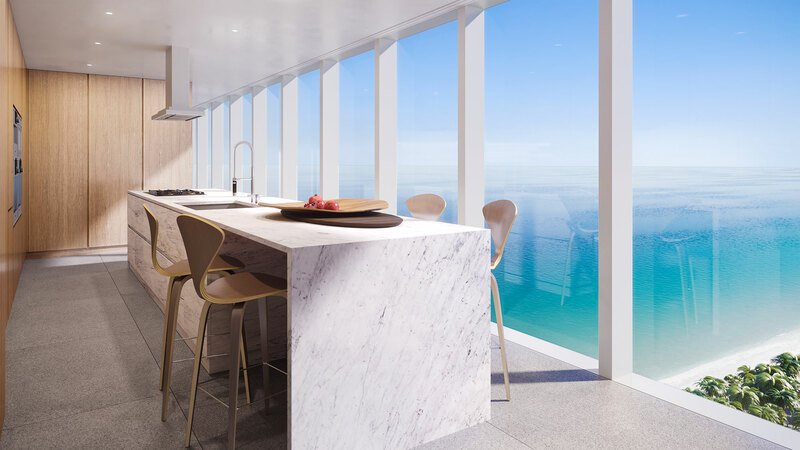 The firm’s philosophy of creating spaces to provide “silence for the eyes, calm for the spirit” made them the ideal choice to design the kitchens and baths at 2000 Ocean. 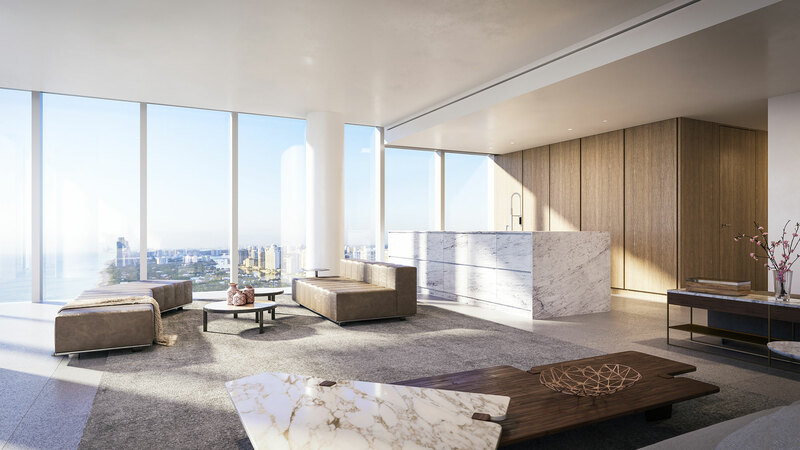 Minotticucine’s devotion to bringing well-appointed materials together with impeccable craftsmanship collaborates harmoniously with the minimalist aesthetic of the residences. Hallmarks of a Minotticucine kitchen are refined stonework and clean lines. 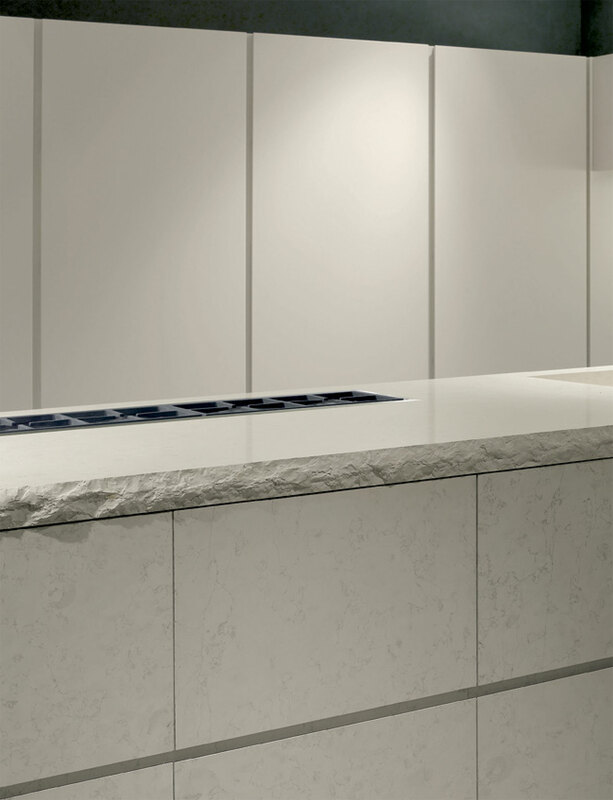 The 2000 Ocean kitchens are distinguished by a sculptural central island with an integrated sink crafted entirely from sumptuous stone, and the rich patina of full-height wood cabinetry. Gaggenau appliances, LED lighting, outlets, vents, and hardware are all cleverly concealed for a seamless appearance and understated elegance, while soft-close drawers contribute to a peaceful environment. Kitchens are offered in two subtly distinct palettes. One pairs natural oak with bianco elegante stone, and the other pairs smoked oak with fossil noir stone. Sanctuary-like bedrooms with smooth Monterey Marble floors lead to serene en-suite bathrooms. 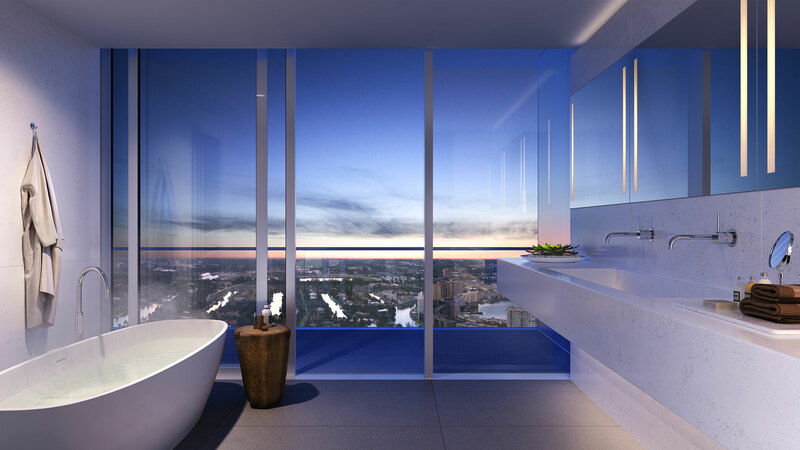 Minotticucine’s signature stonework is detailed by the floating full-slab vanity, a freestanding Agape marble bathtub overlooking the Intracoastal Waterway, and a walk-in stone shower. 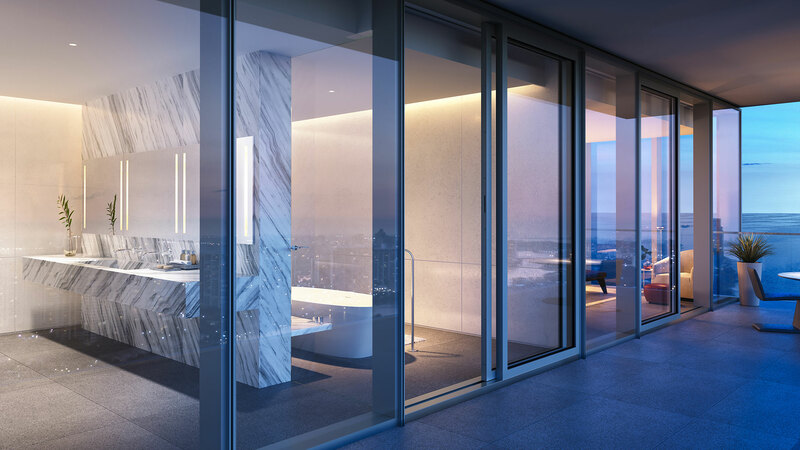 The bathrooms, bathed in light from floor-to-ceiling windows have an advanced LED lighting system to automatically adjust in response to the availability of natural light. Dornbracht and Duravit fixtures and accessories complement the space.